Experts at the University of La Laguna have conducted studies on the ability for people to identify a fake smile when they see one. At some point, we've all had to fake a smile, whether it was for a job interview, or a shameful approach to parents. How convincing was that smile in reality? The University of La Laguna is an institute in the Canary Islands . I'm not really fond of there being a huge educational movement in such a touristy location, but I guess these islands have hidden treasures amongst them. It makes sense to study smiles, because the honeymoons and vacations that take place in this tropical wonderland are likely full of happy faces, and shining eyes. Though not a prevalent American research school, Science Daily chose to include their relevant study in THIS ARTICLE . When creating friendships or telling jokes, and sharing moments, a true smile is the most desirable display to receive. It's interesting that people use the smile in so many other emotions. When hiding embarrassment, nervousness, pain, anger, sadness and more, happiness is the true power to keep moving forward. 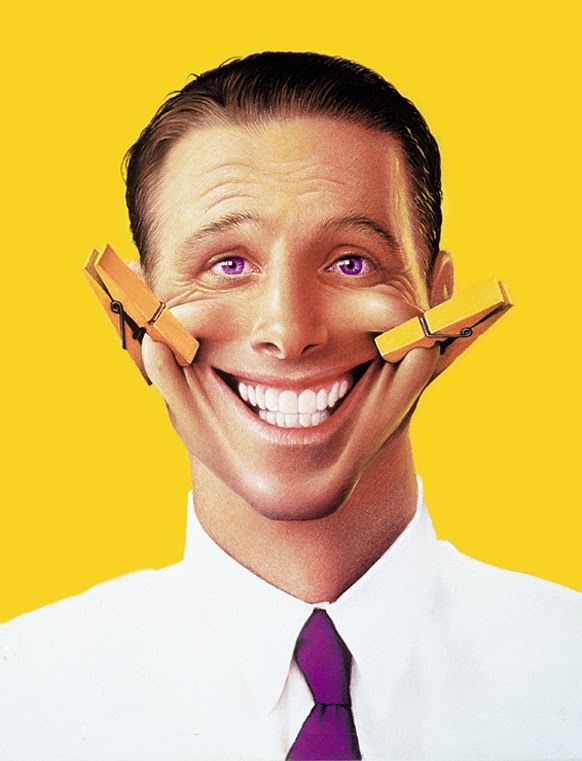 Ambiguously fake smiles convince people of happiness because the smile itself is distracting enough to take attention away from the shine in the eyes. People with social anxiety seemed to find expressions on a computer with unhappy eyes more often than people who were socially comfortable. I guess if one is more conscientious and worried about emotions, they would be more perceptive in reading them. At Penn State, there are so many clubs and so much interaction amongst students, faculty and recruiters. A smile is necessary to move forward. Whether fake or not, people may not be too concerned, because the activity in the brain that's associated with smiles shoots neurons out before it starts to process anything else. That gut feeling we get may be biased by a smile, but should we become socially anxious about that fact or wait for something more substantial to judge a moment on? Smile really demonstrates several different emotions. I am a dancer and when I am dancing on stage, my smile sometimes is forced. Sometimes I smile to cover up my nerves in front of people. I feel it is really obvious when my smile is REAL. My REAL smile is when I am genuinely happy of if someone is making me laugh. I believe that smiles pass on harmones and happiness to other people and really brighten their day. My dad has always made comments to me about always having a "fake" smile in pictures, but it's so hard to ALWAYS have a real smile in them. I try to have a real smile, but it's not always that easy. I really like that the study performed was in an area where so much smiling is done. A body language experts dishes three ways to spot a genuine smile. One key way to look for the wrinkles around the eyes. When a smile is genuine, the muscles will push all the way up to that part of the face. Check out his article for more info! Karly, I completely agree with what you said, I too smile when I get nervous but at times people think I am silly when I start smiling, but at times I wished they knew how uncomfortable I felt. My REAL smile usually comes out when I'm watching a show or talking to someone and something funny unexpectedly happens that catches me off guard and I start cracking a big cheesy smile and start laughing. Dalila, I just tested out what you just said, "Smiling reduces those wrinkles around your face. No one wants to start aging too fast, lol." I went in front of my mirror and smiled I saw no wrinkles however, when I put my mean gangster mean mug on I looked horrible, smh I'm too young to be looking like an old 78 year old man. Marisa, that is crazy I never knew the muscles did that, I guess you truly can't fake a smile. Kathleen, I agree with you I too would rather talk to someone that looks friendly and not angry looking because I would be too worried about saying the wrong thing and as a result I would end up saying the wrong thing. making the person upset with me when I didn't intend to. Does a college education bring hapiness? Get Those Laptops Off Your Laps, Boys!